I read up about battery management, and have been trying to follow the recommendation to charge to 95%, discharge to 20% and repeat. Sadly, the low battery only shows up in the status bar, with no pop-up or audible notification. I get busy working, and the next thing I know, the laptop has powered off because the battery hit its critical low setpoint. I did some searching, and and found the Gnome Power Manager, that allows you to configure low power settings, and notifications, but it isn’t in the Pure repository. Looking for recommendations: is Power Manager the way to go, are there other better options? With a description of your problem so that the support team can help you. Sadly, the low battery only shows up in the status bar, with no pop-up or audible notification. With the information you provided us so far, two things you can try are: install the Gnome-Shell plugin: Battery- status, and check your systems notifications. If they are not, then activate them. Scroll down the page to see the power notifications button and if notifications are enabled, it should say on. Let us know if this solution worked to solve your problem. Thanks for your reply @joao.azevedo. You are correct, when I checked Power Manager is already installed. 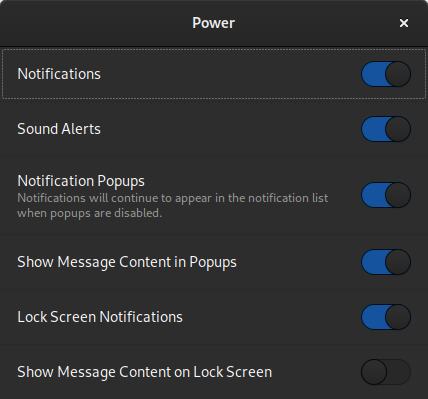 I had previously verified that notifications are enabled, and all the power notifications are enabled. I also turned on the messages for the lock screen. I will try installing Battery Status, and let you know if it changes anything. I would like to point out the helpfullness of this support reply . So solid , clear and complete. Thumbs up . Nice one , keep it up. Still not getting any power notifications: not when I plug in, not when I unplug, not when power reaches 100%, not when power drops to a low level, not before it goes critical and turns itself off. And yes, the support here in the forums as well as from the official tech support email is amazing. Thank you! @Amarula Thank you for your feedback, we will investigate and reach back to you. One question by the way. 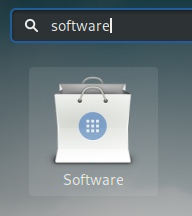 Are you able to see the battery percentage in the right side of the top bar?